It's been awhile since I've written in, mainly because Cannes eats all will to live. Since recovering I've been fooling around with Google+, trying to decide where it fits into my life. The super-short first impression: Google+ goes right where Google Wave went wrong. This time around, it's hitting all the right buttons, especially where privacy and ease of use are concerned. The +1 feature may change the face of SEO, tilting it further away from black-hat marketing tactics and more in favour of content usefulness. Its ease of use and potential to scale will make the data accrued on it increasingly important for social media monitoring. Content engagement is significant. It's easy enough to +1 something, but it's also re-enlivening comment culture. I made one comment today on a totally innocuous post and people from all over the sphere are leaping onto the stream, adding value to an article that would have gone unnoticed on Twitter, or that wouldn't have received much response on a blog. In terms of feel, posting on Google+ is about as easy as on Twitter, with a final publishing result that more resembles Tumblr or Posterous. Images and videos are beautifully presented. It also has an advantage over such platforms in the sense that you don't have to work so hard at outset to build your community -- nearly everybody uses Gmail and is hankering for an in. (In Early Adopter-land, anyway.) Days after joining, over 100 people added me to their streams -- well before I'd posted anything, and most were people I knew and had already engaged with previously. That's a good figure. As previously mentioned, Google properties like Picasa and YouTube are automatically integrated -- so if you're not already a user of these services, they are instantly more accessible. I generally favour Flickr and Vimeo but have already tested the photo-upload feature, which is ridiculously simple. Presentation is great and privacy settings are intuitive. This has basically made me a Picasa user overnight, and I'll probably use this for quicker video uploading and sharing, too (which will likely resuscitate my dead YouTube account). I said in the title of this post that this could also change PR. When you write about ads and technology, you're heavily reliant on imagery and videos -- tools that help illustrate the merits of a product, service or campaign. Email is the traditional darling for getting PR messages across, but it isn't great for scrolling through imagery or videos in an intuitive way -- you usually have to leave your email client. And then there is the question of organising PR notices that you mean to cover, but never do, because it gets lost in your email. These problems don't exist with Google+. (Not yet, anyway.) PR folks can write a quick piece, add imagery and videos in a snap, and publish only to a circle of journalist contacts (or the wider public). The publishing style feels like Facebook but is less ephemeral -- it is easy for people to skim, copy/paste from and return to later, making it more like Tumblr but in a closed ecosystem with great scale. Then there is the "Hangout" feature, which enables you to video chat with up to about 10 people. Nice option for briefings, meetings ... or hell, just hanging out. The main reason I think Google+ is interesting is because the barrier to entry is low, potential to scale is high and usability is fantastic. I can see people compulsively using this the same way they compulsively use Facebook, except they don't necessarily have to leave universes that are important, like Gmail or Google Docs. This is a bit like what Rockmelt tried to do except you had to download a new browser -- a small but irritating obstacle to use, which Google has the luxury of being able to skip. It's also directly linked to the identities of most people via their email, connecting their social activity to their existing Google profiles and producing a broad picture of who you are and what you're doing on the Web. This also minimises spam inside the platform. One critique thus far. 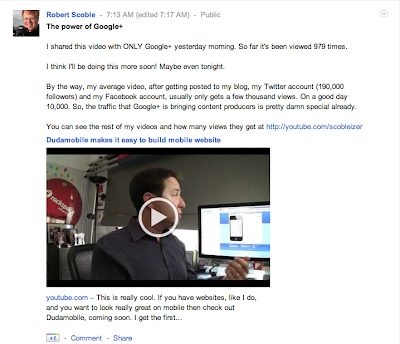 My impression is that you can upload to your Google+ via mobile, but only from Android. That's not necessarily bad news, given that Android adoption is exploding, but it does cut out tech-savvy compulsive socialites who are anchored to iPhone or other smartphone platforms. Google's attitude is historically more open than its peers, so I hope this changes once confidence in the viability of Google+ grows. Love this write up Angela. Funny you bring up the Android App because Instagram is only on the IPhone. I just got in yesterday and so far I like it. But it is easy when starting fresh vs when you have all the accumulated clutter later on. The marketers are whining about the fact they could be cut out. No. They can still pay for digital ads I am pretty sure and the fact Brand pages existed was an accident and it allowed marketers to force their way into what should be a more private comm channel/platform. 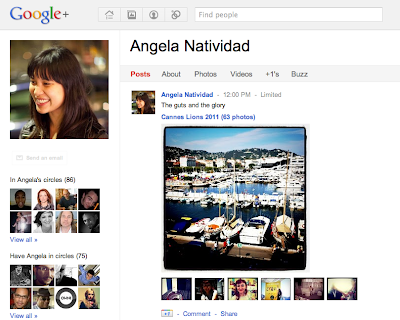 In my opinion, and this is just an opinion, the real beauty of Google+ comes from the way you use it in mobile. It encourages you to go out and interact with friends. The huddle feature (BBM for the blackberryless) will work extraordinarily well for arranging meet ups between your circles. And the auto upload feature for pictures makes you instinctively want to share them because they are already there. Even when you log in from your computer they're right there waiting to be uploaded. Also you can edit! That is a wonderful feature that cannot be overlooked. The biggest barrier to entry I've seen is rebuilding your network and figuring out what it's for from a personal perspective. There's no "wall" to write on so those who are primarily FB users might be confused at first but it is very easy to use. I think it's a lot like Tumblr but with the ability to 1) comment 2) filter and 3) group video chat!! I love it, and I don't think I'm in the minority.